Engaging, interesting and informative talks on everything animal! From pet hamsters to lions on the Serengeti, Dr Sarah Millsopp has it covered. Born in Northern Ireland, Dr Sarah grew up watching David Attenborough documentaries and volunteering in any animal environment she could make her way into. Consequently, she went on to gain an Honours degree in Zoology, and a PhD in Animal Behaviour and Welfare from Queen’s University in Belfast. 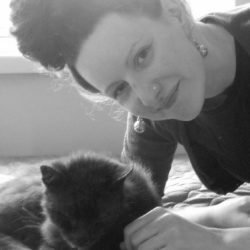 Sarah then proceeded to specialise in companion animal behaviour, researching cat and dog behaviour at QUB, a subject in which she is extensively published. Simultaneously, for the last 8 years, she has been running her own pet behaviour counselling business offering pet owners guidance with their animal’s problem behaviours. Using scientifically sound and ethical methods, the majority of pet behaviour problems can be improved within a short period of time. From debates on TV discussing animal welfare issues to providing Animal Care lectures to teens excluded from mainstream education, Sarah has vast public speaking experience, and is ready for any speaking engagement. Furthermore, Sarah has lectured in Animal Behaviour at Queen’s University in Belfast, and has just been appointed to the role of Lecturer in Animal Behaviour and Welfare at the University of Chester. As a speaker, Sarah is both knowledgeable and enthusiastic about her subject, and has received excellent reviews. She aims to improve the public’s understanding of animal behaviour so they can all enjoy better and safer relationships with their pets and the many species of animal with whom we share this planet. Passionate about animal welfare, Dr Sarah has been actively involved in animal behaviour and welfare research for the last 10 years, and regularly appears on the radio discussing pet behaviour. She is a Provisional Member of the Association of Pet Behaviour Counsellors (APBC) as well as a full member of the Association for the Study of Animal Behaviour (ASAB). Having been a pet owner her entire life, Dr Sarah is available to write and present talks on a wide range of animal related subjects to Schools, Colleges, Universities, Veterinary Surgeries and seminars across Ireland and the UK. Fish – they’re not as stupid as we think!